Created by cyclist Jonny G. Goldberg, spinning is an indoor cycling program done on a specially designed bike that simulates real cycling terrain, conditions and techniques. 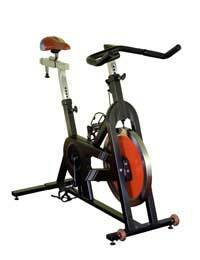 Spinning bikes were created to accommodate all males and females, shapes and sizes, as well as athletic ability. However, to maximize the benefits of this aerobic workout and minimize injury, proper form has to be utilized. Each time a spinner climbs onto the bike, they have to re-adjust the seat height and position, handlebar height as well as pedal position. To determine the correct seat height, place your feet in the toe cages/clips on the pedals and rotate the pedal until one leg reaches the bottom of the pedal stroke. Ensure there is a slight bend in the lower knee and keep feet flat and in the centre of the pedal. The seat also adjusts forwards and backwards, which helps keep the upper body and knees in their correct positions. To determine if the seat needs to be moved, while seated, check to see if you can reach the handlebars comfortably, while maintaining a slight bend in the elbows. Move pedals until they're level with each other. "Your seat is in the right position when your knee cap is directly above the centre of your pedal," according to Mad Dogg Athletics (MDA). Crunches, push-ups and excessive side-to-side leaning are inefficient while on the bike and can throw your balance off, as well as potentially strain your back. Building upper body strength is best done off the bike. Actions that isolate the lower body - such as quad stretches, should also be done off the bike. Jumps create a smooth transition between seated and standing positions. However, when they are done too quickly, they do nothing for the spinner. The key to maximizing the benefits of jumps is proper speed. Pedal speed is also important. Riding at a high cadence, without resistance, is ineffective and can cause the rider to bounce in the saddle, which is not only uncomfortable, but it also causes the spinner to lose focus on his/her form, which can lead to injury. "Riding at a constant pace with good resistance develops power, strength and endurance," according to MDA. Every workout must end with a stretch - done off the bike. Taking part in spinning classes while pregnant is safe, if precautions are taken. Workout sessions should be limited to 45 minutes or less to avoid a drop in blood sugar, which can be more dramatic while pregnant. It is also recommended that pregnant women wear heart rate monitors. They should also keep their heart rate 20 beats below their anaerobic threshold (AT). Following the perceived exertion chart is also recommended, but again, at 20 beats below their AT. The pregnant spinner may feel like pushing things farther, but should not. As women continue through pregnancy they should avoid out of the saddle movements. The abdomen's growth creates a change in the women's centre of gravity. Moving forward, out of the saddle, can lead to undue stress on the knees because of the increased weight and joint laxity associated with pregnancy. Spinning provides an excellent cardio workout, while toning the body's muscles; however, it does not work all muscles equally - particularly in the legs. If spinning is your exclusive form of exercise, muscle imbalances will occur. Spin enthusiasts also have to be mindful that they can succumb to over-use injuries in their knees, hips and lower back.